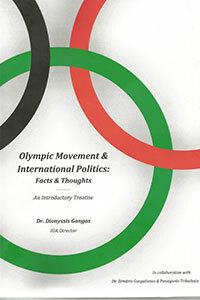 An introductory treatise was published by the International Olympic Academy in May 2016, by Professor and IOA Director, Dr Dionyssis Gangas, entailing many features relative to typical and substantive intervention of internal and international politics in Olympic Movement. One of the most controversial and debatable subjects, which, curiously, only a few analysts of the Olympic Movement have investigated, are the different aspects in which the discipline of domestic and international politics has affected the development of Olympism, both in the content of its very philosophy, as well as in its practical implementation through structured sports and primarily, the Olympic Games. It is possible that this lack of systematic study and promotion of this phenomenon may be attributed to the fact that throughout the course of the Olympic Movement and mainly the development of the Games, the various events that have defined the interaction of sports and politics were dealt with individually and not as branches of the same tree which spread out gradually and covered all facets of the phenomenon of this relation. The purpose of writing this treatise is to provide the students of the Postgraduate Programme in Olympic Studies, organized by the International Olympic Academy and the Department of Sports Organization and Management of University of Peloponnese, with the potentiality to observe more easily the relation between the Olympic Movement and its political exploitation, a subject that contains, by nature, many distinctive qualities. This treatise will constitute the core of a textbook of the writer which will be published in 2017.